Completing The Mission Roy has spoken in 38 states in over 400 Churches on the local Church, District Association, State Assocaiton and National Association levels. He has a heart for the local church and wants to be used. He’s been a successful husband, father, pastor and Christian leader. Roy continues to speak at State wide Christian Worker’s Conferences, Men’s Retreats, Couples Retreats, Family Emphasis Revivals, Caregiver Encouragement Seminars, Leadership Training Workshops and a variety of ways to help your ministry fulfill its’ mission and vision. He would be honored to assist your ministry. 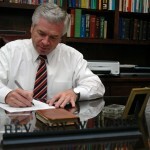 Roy has spoken in 38 states in over 400 Churches. He has a heart for the local church and wants to be used. He’s been a successful husband, father, pastor and Christian leader. Roy continues to speak at State wide Christian Worker’s Conferences, Men’s Retreats, Couples Retreats, Family Emphasis Revivals, Caregiver Encouragement Seminars, Leadership Training Workshops and a variety of ways to help your ministry fulfill its’ mission and vision. He would be honored to assist your ministry.